Hello and welcome to the lovely experience of planning your wedding ceremony. To tell you a little of my career. 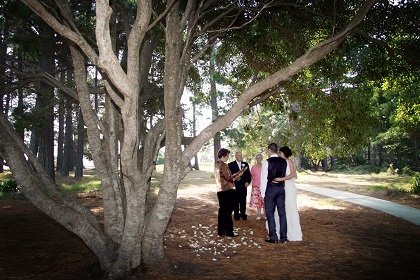 I have been a busy celebrant in the Shoalhaven, Southern Highlands, South Coast and Sydney for approximately 14 years. I have studied the history and development of ceremony and have acquired certificates in ceremonial public speaking. The type of ceremonies that couples seek vary as much as the many personalities getting married. From formal, traditional, informal, intimate, family orientated, non-traditional, in over 800 weddings, it has been my experience that the main ingredients couples seek, are “relaxed, happy and sincere”. The wedding ceremony itself creates the atmosphere for the day, The words spoken on your wedding day are what unites you both. My wish for you is an occasion rich in meaning for you and for the family and friends you invite. Enjoy choosing the type of ceremony you would like and also readings which suit your feelings and circumstances. Readings can bring character, romance even laughter to your ceremony. I am delighted to meet for a no obligation chat, to guide you through paperwork, and share ideas. I will bring with me, warmth, calm, a love of my vocation, and genuine pleasure to be celebrating your marriage. Enjoy planning your dream, I’d love to join you. A copy of the "Notice of Intended Marriage" can be downloaded here. Before the wedding I will need to see your Birth Certificate if you were born in Australia, otherwise your passport. Also, if you have previously married, I'll need to see proof that you are no longer married. I can be contacted on 02 - 4448 6074 and look forward to assisting you to make this a special day. Don't stress - This day is to be enjoyed!